We left Patagonia Lake State Park and headed over to Bisbee. 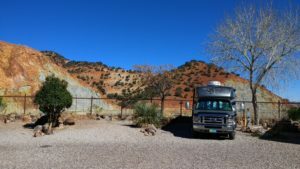 We stayed at the Queen Mine RV Park right in town so that we could see the Queen Mine tour and then walk to dinner in Bisbee. The RV Park was high on a little plateau and we could look down and get a good look at the town. The RV Park was small but it had all the amenities. The Queen Mine opened in 1877 and was a major producer and was shut down in 1975. The Queen had an extraordinary high grade of copper ore at 23%. It produced over 8 trillion tons of copper. 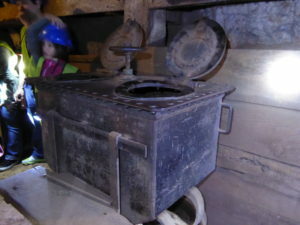 The Queen also produced gold, silver, lead and zinc. All of the tour guides actually worked in the mine. Our tour guide was Joe. 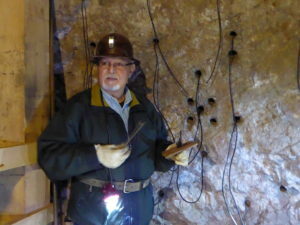 He worked in the mine from 1968 until it closed in 1975. 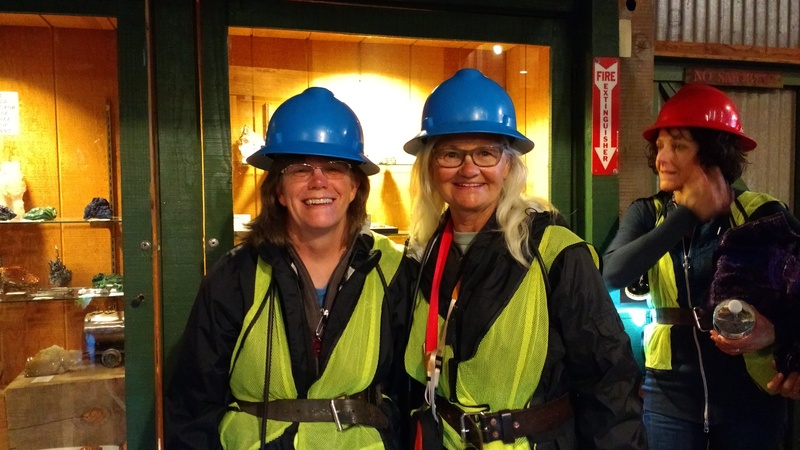 We had to get suited up to take the tour. You take a tram into the mine. The tram was basically a 2” x 12” board that you sat saddle style on with a bar above your head to hang onto. The tram goes into the darkened mine and we used our lamps to spotlight what we wanted to view. 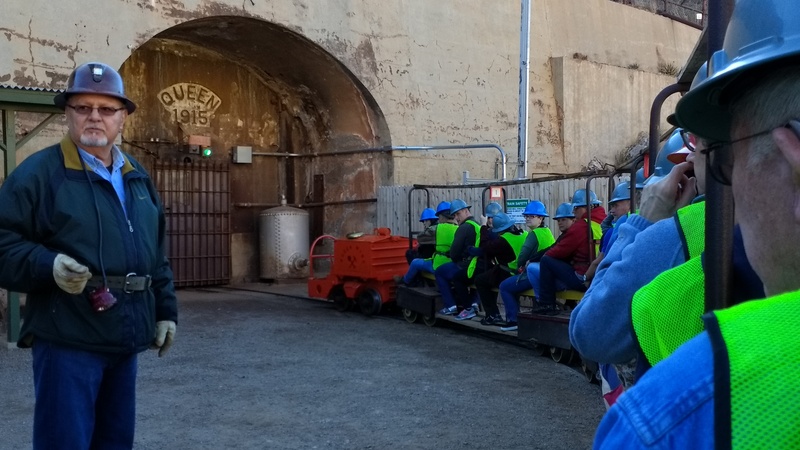 We stopped at several stations and learned about what the miners work involved. 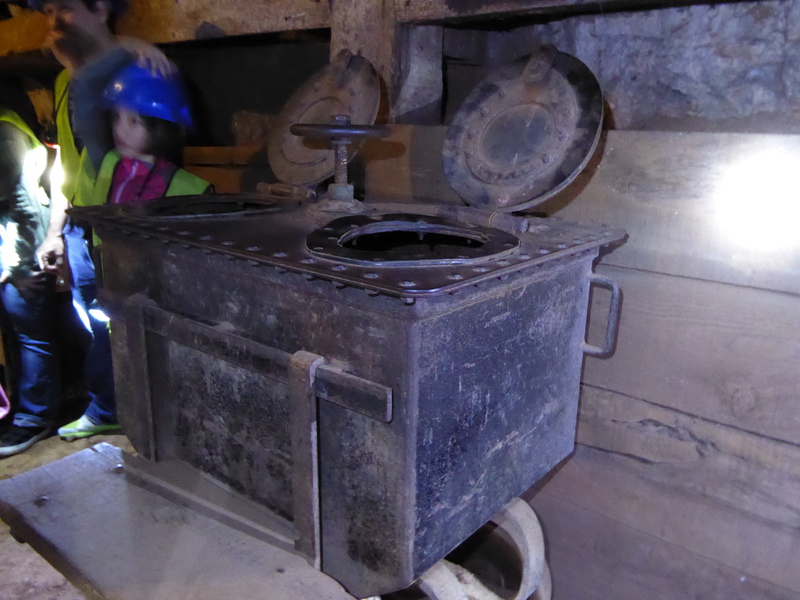 One of the most interesting was how they loaded the dynamite into the cave wall. They had a very specific pattern including how long they cut the fuses so that they lit in the order desired. They could only blow the dynamite at 3:30 each day – which was quitting time. After the mine tour we went and had a good Mexican dinner at Santiago’s. We had fish tacos from the Sea of Cortez and a sampler platter. We stopped at Bisbee primarily to see the mine, however the town is quite interesting. 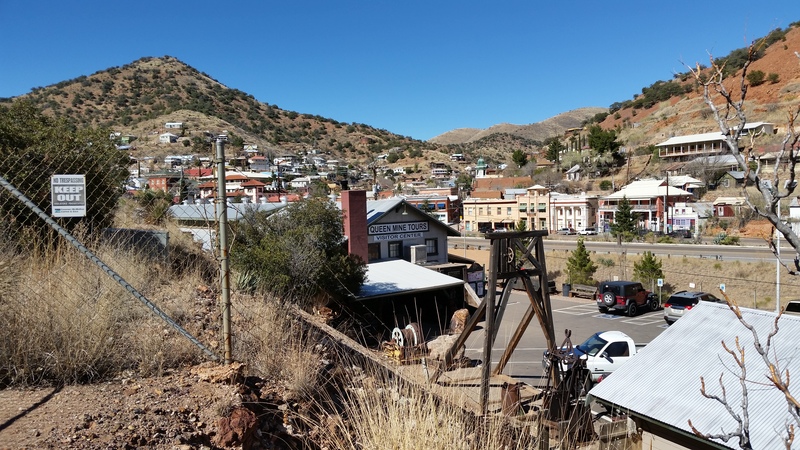 Bisbee is a quaint town with lots of shops and small food establishments on one street that winds up the mountain. We enjoyed our dinner and then walk up the street and back to window gaze and burn off some of those calories! This entry was posted in Arizona and tagged Bisbee, Queen Mine. Bookmark the permalink. 4 Responses to Touring the Queen Mine in Bisbee Arizona! What a great adventure! Love quaint little towns with a little bit of history! Looking good ladies. Let the adventures continue! Living life to its fullest! You both deserve it! We love seeing new places. I guess that’s part of the adventure. The weather has been great…sunny, shorts and tee shirts! 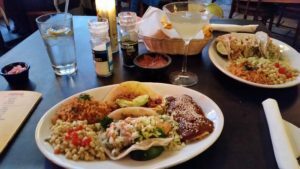 I loved Bisbee-great Mexican food and fun atmosphere! I’m with Grace- enjoy each day and you DO deserve many happy trails ahead! We are loving every minute. We plan for a few days at a time and if we want to do something else and change our minds, that’s okay. That’s the beauty of it!